In 1986, as the micro-computer market was getting ill, some french manufacturers thought that Telematic was the solution. Oric with the Telestrat, Thomson with the TO-9+ and Exelvision with the Exeltel proposed computers with built-in modems and teletext features. The Exeltel was surely the most innovative of these three systems. 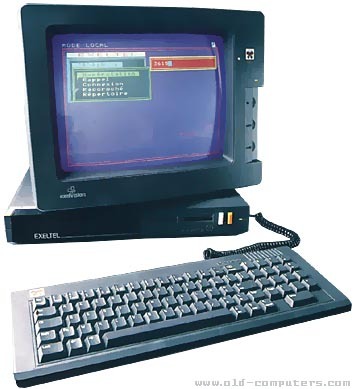 It's a "super Minitel" wich can also be used as an answering machine, or can be your children teacher by downloading educative software through a dedicated network. BUILT IN LANGUAGE Exelcom, Exelquad, Exelspeech. see more Exelvision Exeltel Ebay auctions !